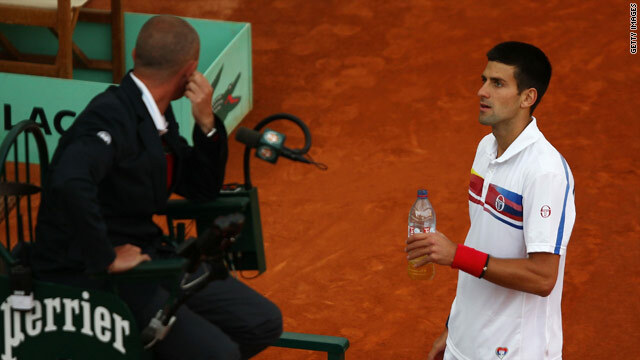 Novak Djokovic talks to the umpire shortly before his match against Juan Martin del Potro was suspended. (CNN) -- An intriguing clash between Novak Djokovic and 2009 U.S. Open champion Juan Martin del Potro at the French Open was halted by bad light with the match tied at one set all. The much-anticipated battle was late getting underway after being scheduled as the last match of the day and was switched away from the main Court Philippe Chatrier. With the Court Suzanne Lenglen swiftly filling up with spectators, and with a superb match developing, play was finally ended at 9.12pm local time in Paris. Serb Djokovic, the world number two, has been in imperious form in 2011 with 41 straight victories to his name and took the first set 6-3 to a backdrop of boos as queuing fans struggled to get into their seats. But Del Potro, from Argentina, roared back in the second set, much to the delight of the crowd, racing into a 3-1 lead before securing the set 6-3. The players will return on Saturday at around 15.00pm local time, after Andy Murray's clash with Michael Berrerm, to see who will face Richard Gasquet, the French number 13 seed, after he beat Thomaz Bellucci, from Brazil, 6-2 6-3 3-6 6-3. Roger Federer cruised into the last 16 after a comfortable straight sets victory over Janko Tipsarevic. Third seed Federer, the 2009 champion and playing in a remarkable 46th consecutive Grand Slam tournament, beat the 29th-seeded Serb 6-1 6-4 6-3. "I served well to keep me out of trouble and from the baseline I was mixing it up well. It was good to have another early finish which is nice," Federer told reporters. "I thought that it would have been a lot more difficult. The first set was the key. That gave me confidence and it made him doubt his game plan." Federer will now face fellow Swiss Stanislas Wawrinka after he beat 17th seed Frenchman Jo-Wilfried Tsonga in a thrilling five-setter that finished 6-3 4-6 6-7 7-6 6-2. In other matches, seventh seed David Ferrer of Spain crushed Ukraine's Sergiy Stakhovsky 6-1 6-1 6-3 and he next faces French ninth seed Gael Monfils who beat Belgium's Steve Darcis 6-3 6-4 7-5. Unseeded Fabio Fognini reached the last 16 for the first time by putting out Spanish 30th seed Guillermo Garcia-Lopez 4-6 6-3 6-3 6-1. Italian Fognini now faces Spanish veteran Albert Montanes, who beat Russian 12th seed Mikhail Youzhny 6-1 7-6 6-1 to also reach the fourth round for the first time.